Made with Whole Fruit. Kosher - KLBD.In 1797 the first jar of marmalade was produced in Dundee. 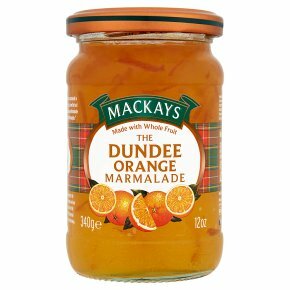 Mackays, a family business, is now the last remaining producer of The Dundee Orange Marmalade in the Dundee area - "The Home of Marmalade." Using a traditional open copper pans, the highest quality bitter Seville oranges and our authentic methods, we ensure rich fruit flavours in every batch and that special home-made taste you expect from Mackays.